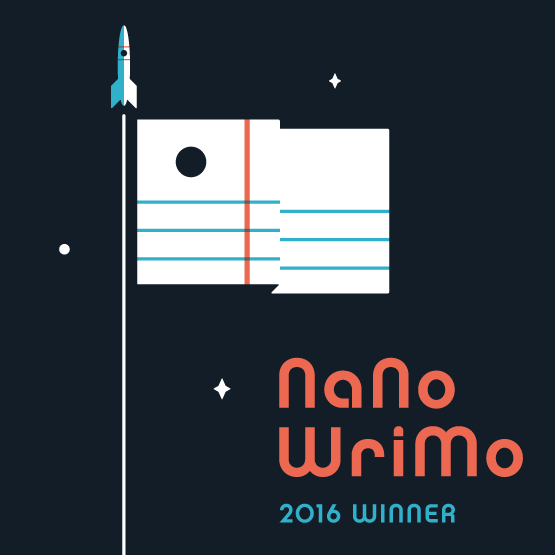 Well, November is over, and I did it: I wrote a 50,000 word novel! I first participated in National Novel Writing Month (NaNoWriMo) in 2014, when I wrote Intelligence, a new adult fiction novel that is still in the works. The goal of NaNoWriMo is simply to get a draft out, which will then be revised. It helps to be able to tell yourself, It doesn’t have to be good, just keep going. In 2014, I felt like I had a coffee buzz the entire month. I wrote in the morning, and then went to work where my officemates consistently asked, “Are you okay?” Ideas would pop into my head all day long, and I’d race home to incorporate them. So I was looking forward to participating this year. But it was very different. After the busiest October on record (2 weekend-long weddings, 3 day-long work events, my 20th college reunion, the state fair, and Halloween), I woke on November 1 thinking, “There’s no way I can write.” But I did. And I wrote every day after that, in spite of feeling like a slug. I plateaued mid-month with no ideas. I’d already written everything I’d imagined, and I had 25,000 words to go. I tried to let go of the outline that had formed in my head, and new action emerged: there’d be a revolution, with a battle scene, and then the second villain would emerge, necessitating another encounter. Then in the last week, it struck me that the entire story was extremely childish and that I have no ability to craft fiction. But I kept going. 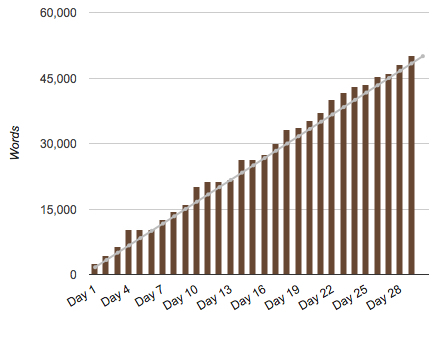 So, there it is, my chart of 50,000 words in one month. You may be wondering why I haven’t said a word about the actual novel. Well, it’s a romance novel. I wrote it because I wanted to do NaNoWriMo, it seemed too soon to start the sequel of Intelligence, and I didn’t have another idea. I also find writing romance liberating–it gives me this feeling that I can write whatever I want, which is a feeling I’d like to cultivate. And, romance may be a good way to make money as a writer, while working on additional, non-money-making projects. I’m still considering how to present my romance writing to the world–I might use a pen name to keep my bread-class-teaching self separate from my romance-writing self. So for now, I’ll just say that it’s a romance novel in a fantasy world. This entry was posted in My News on December 1, 2016 by Emily.